Andy Redfearn, Data Curation Officer at the UK Data Service, takes a look at patterns of use of the UK Data Service’s Secure Lab. Andy is a data scientist, part of our highly specialised Ingest Services team, where he prepares data and documentation for addition to the Secure Lab. The Secure Lab is an Economic and Social Research Council (ESRC) funded service established to give qualified researchers safe, secure and free access to sensitive or confidential business, social and economic microdata that cannot be released under current End User Licence or Special Licence agreements. Established in late 2009, the Secure Lab (previously known as the Secure Data Service) was made possible with funding from the ESRC and with support and advice from the Office for National Statistics (ONS) along with data archives and technology experts from across Europe. From March 2011 it has been supported with an online data catalogue and specialised training for approved and accredited researchers. The Lab welcomed its first users in June 2011. The Secure Lab uses the ‘5 Safes’ framework, a set of principles for safely using secure data based on the Safe People, Safe Projects, Safe Settings, Safe Outputs Safe Data protocols explained in the short animation The 5 Safes of secure access to confidential data and described in detail in the blog Access to sensitive data for research: ‘The 5 Safes’. Secure Lab data cannot be downloaded; once users and their proposed project(s) have been approved by the data owner, and users have successfully completed the Safe User of Research data Environments (SURE) training course, Secure Lab users may analyse the data remotely from their institutional desktop or in the UK Data Archive’s Safe Room. Microdata are provided to the users in Stata, SPSS and tab-delimited formats. There are currently 94 Secure Access studies available to trained Accredited Researchers. 55 of these studies were deposited by the ONS Virtual Microdata Laboratory (VML). Most of the ONS studies are sensitive or confidential economic surveys of UK businesses, such as the Annual Business Survey/Annual Respondents Database (ABS/ARD) and the Business Structure Database (BSD). The Secure Lab ONS collection also includes detailed versions of social surveys, such as the Labour Force Survey and the Living Costs and Food Survey. The 39 non-ONS studies include sensitive or confidential socio-economic survey microdata deposited by eight different government departments or research centres (Table 1) and individual researchers, and include the Millennium Cohort Survey (10 studies) and Understanding Society (3 studies). Who uses the Secure Lab? 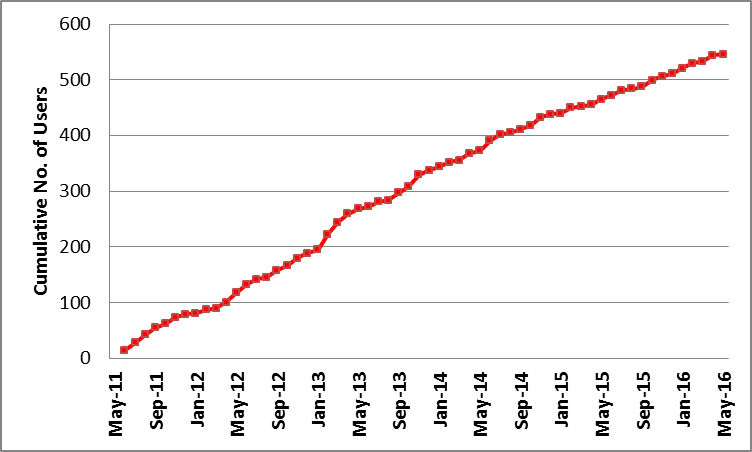 The number of Secure Lab users has increased steadily over the 5 years since the Lab was first opened for users, totalling approximately 550 in May 2016 (Figure 1). Each Secure Lab user registers one or more research projects shared with one or more other users, who can all access the same Secure Access studies approved for that project. All accredited project members can access, read from and write to the same project space when logged in to the Secure Lab. The number of registered projects totalled over 400 in May 2016. Secure Lab users are primarily academics or postgraduates affiliated with UK institutions of higher/further education, although some are affiliated with research centres. Users from the non-higher education sector can use similar sensitive or confidential data in one of the ONS VML Labs. International users can access Secure Lab data whilst working in a UK higher education institution that has signed the user’s Secure Lab User Agreement. International co-authors can contribute to Secure Lab data projects from their institution abroad but only their UK based project co-author will have access to the data. A total of 72 institutions are currently represented as Secure Lab users. The London School of Economics has the highest membership, with almost 70 users. Approximately 50% of the Lab users are affiliated with ten UK institutions including the University of Sheffield, University College London, the Institute of Fiscal Studies and the National Institute of Economic and Social Research. The ability to ‘share’ a secure working project space with other approved project members has been well utilised, although sharing amongst users from different institutions is relatively infrequent. 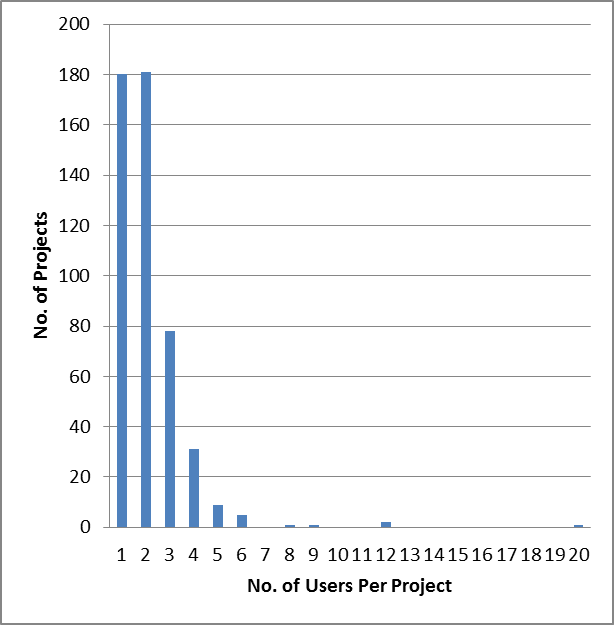 Over 60% of the projects are or were shared by two or more users, although few projects are shared by more than four users (Figure 2). Project-sharing is usually confined to users affiliated to the same institutions. Less than 20% of the projects are or were shared by users from different institutions (based on data up to July 2015). The large ONS business datasets (ABS/ARD, BSD and the Annual Survey of Hours and Earnings [ASHE]) are the most popular Secure Access studies ordered for Secure Lab projects. The ‘top ten’ studies/series currently represent over 70% of the Secure Lab orders (Table 3). Whilst Secure Lab users are now provided with access to the data in all three available formats (Stata, SPSS and tab-delimited), Lab applicants are asked which of the three particular formats are preferred for their project(s). Stata was requested as the preferred format for nearly 90% of the projects, followed by SPSS at 13% and tab-delimited at 4% (users can respond with more than one format). Use of the Secure Lab data is helping to support impactful research and as a result contributing to policy recommendations. The Institute of Fiscal Studies working paper ‘The short run elasticity of National Health Service nurses’ labour supply in Great Britain’ used the ASHE dataset to examine how differential labour market conditions across localities impact on the elasticity of supply of NHS nurses. Findings determined an increase in pay for NHS nurses in localised areas, such as London, as opposed to a national level, in combination with improved working conditions and area supplements, would benefit the employment and retention of staff. The BSD dataset is cited in a report produced by Nesta and Creative England highlighting hotspots of creative activity in all nations and regions of the UK. Our case study ‘Creative clusters in the UK’ examines this report. The creative industries are a high growth sector making economic contributions with a Gross Value Added (GVA) of £84.1 billion and accounting for 5.2 % of the whole UK economy. The report provides data that economic development agencies and policymakers in charge of promoting business growth can use when setting strategic priorities. The report maps the concentrations of creative activity in the country and describes important differences that exist between creative clusters. The study identified 47 creative clusters in the UK. 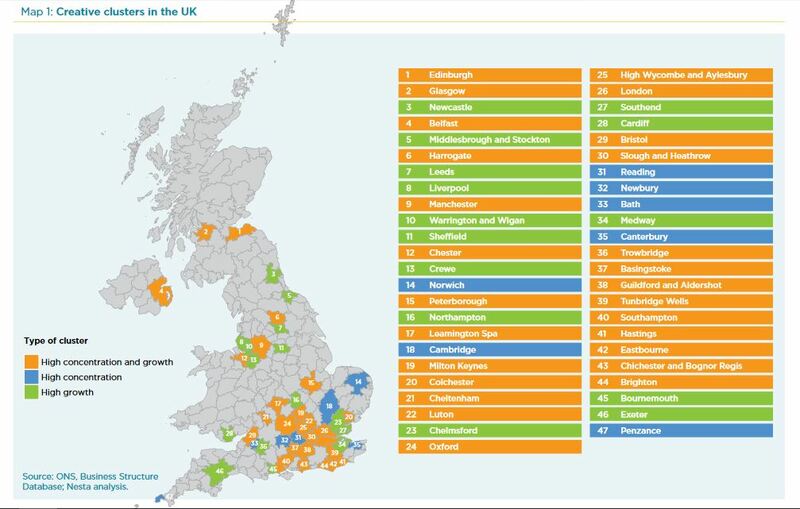 The interactive map of the geography of creativity in the UK shows economic performance of creative sub-sectors and industries overall across the UK. The continued growth in Secure Lab use in terms of registered users and projects, available datasets, outputs and citations, shows no signs of reducing. New and existing users are welcome to apply for access to Secure Lab data by following the instructions on our webpage Access to the Secure Lab.